To celebrate the 20th Anniversary of Big Carp magazine, this series of books entitled ‘Big Carp Legends’ will encompass the greatest names in carp fishing history over the past two decades. The content of the books in this series will be a mixture of articles from the archives of Big Carp, life histories of famous anglers and original articles specially commissioned for the series and never before published. One by one these books will build into the greatest collection of modern day carp fishing history ever printed; a collection that every serious carp angler will want to own. One of carp angling’s characters and founder member of the Savay Syndicate – the ‘Looney Rota’ was named so because of him. Sally the carp was named by him when he landed the country’s biggest ever winter caught common, many moons ago, and for a while ‘Sally’ was the world’s best known carp. Inventor of the unhooking mat, Albert rocked the angling world a decade later by smashing the record brace with two huge ‘spawny’ monsters from the North Bay. Pioneer of Cassien, the rivers Lot, Seine and Yonne and Bulgaria, Albert is a seasoned traveller, but his heart has always been at the banks of Savay. Now here is your chance to learn al about this iconic angler from his early beginnings at Furnace, Chobham and Pippingford, fishing alongside the icons of the seventies – Hutchinson, Little, Middleton and Maddocks in the Colne Valley, always with long-time fishing buddy, Bob Baker. 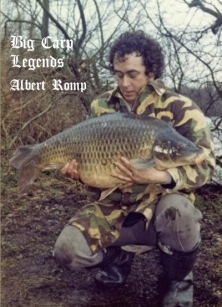 One of carp angling’s good fellas – the amiable and very funny Albert Romp.